In the 1970s and 80s he was very often in Europe to play with European musicians, especially in Switzerland, where Werner X. Uehlinger started HatHut Records just to document his music. Around that time Ken Vandermark heard Joe McPhee’s album Tenor for the very first time and according to him this changed everything because since that moment he knew that this music was not only chaotic but “organized sound”, as he calls it. 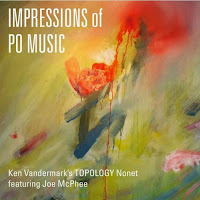 In the meantime Vandermark and McPhee have been playing together very often and in 2009 Vandermark, Jeb Bishop, Tim Daisy and Dave Rempis played arrangements based on McPhee’s HatHut albums Topology, A Future Retrospective and Tenor, all of them albums which are typical for McPhee’s concept of Po Music. Finally, McPhee agreed on Vandermark’s suggestion to record an album with him as a soloist in front of a larger group playing his compositions. This CD is the result – and I guess there are no two opinions to the fact that it is simply great. “Impressions of Astral Spirits/Age”, the first track here, displays feverish, exciting, yet intimate communication – actually something very beautiful. After a New Orleans blues intro the track rises like a huge wave before it breaks and then crashes against a cliff bursting into a universe of ocean spray. Yet, this is only the beginning: “Impressions of Future Retrospective”, the next track, is a monotonous, repetitive monolith starring Fred Lonberg-Holm playing a riff between Willie Dixon’s “Spoonful” and Billy Cobham’s “Crosswind”. With him and Tim Daisy in the back Josh Berman, Dave Rempis and Jason Adasiewicz, whose vibes give this piece a strange film noir quality, are having a ball until Lonberg-Holm stops all of sudden for an expressive sax/cello conversation. The most beautiful and harmonic composition is “Impression of Sweet Dragon”, a very subtle and fragile conversation between trombone, sax, clarinet and vibes, as if the instruments would caress each other before the others drop in. "Impressions Of Goodbye Tom B.," an unaccompanied tenor duet between Joe McPhee and Ken Vandermark, might be the most emotional moment for Vandermark because he could play this composition with McPhee 20 years after his father had played it to him. Nevertheless, my favorite is “Impressions of Knox” because of its irresistible sax blues riff and Lonberg-Holm’s solo which tries to destroy everything but fails because the riff is too strong. And there is even a very short allusion to the James-Bond-theme. Who says that free jazz has to be deadly serious? The nonet is: Joe McPhee: tenor saxophone; Jason Adasiewicz: vibraphone; Josh Berman: cornet; Jeb Bishop: trombone; Tim Daisy: drums; Kent Kessler; bass; Fred Lonberg-Holm: cello, electronics; Dave Rempis: saxophones; Ken Vandermark: clarinet, tenor saxophone. It was truly the best addition. Any idea about the next CD?